Raize iPhone Video Converter can convert almost all popular video/movie formats to iPhone format. All popular video/movie formats are supported, including AVI, MPEG/MPG/DAT, WMV, ASF, MP4, M4V, 3GP, 3G2, H264, MPEG4, AVC, MOV, QT, DivX, XviD, VOB, FLV, etc. The amazing output quality with super fast conversion speed is brought you by the built-in power MPEG4 encoder. All the output iPhone MP4 videos fit your Apple iPhone's 3.5-inch widescreen. The another thing is that, the user friendly interface makes Raize iPhone Video Converter the perfect solution for both new and experienced users. Other excellent features including: convert in batches, drag-drop to load video files and start conversion. Supports batch conversion, and gives you the ability to convert multiple files at the one time. All popular video/audio encoders/ decoders are included, so that you are able to convert all supported audio and video formats. enjoy all your music, audiobooks, videos, TV shows, and movies on iPhone's beautiful 3.5-inch widescreen display. Drag-drop to add or load video files into Raize iPhone Video Converter. Just drag the video files from Windows Explorer into the window of this utility, the conversion will be started automatically. Built-in power encode and decode engine, provide extreme conversion speed. You can use Raize iPhone Video Converter to convert MPEG-1, MPEG-2, DVD/SVCD/VCD to iPhone video format that can be played on Apple iPhone. 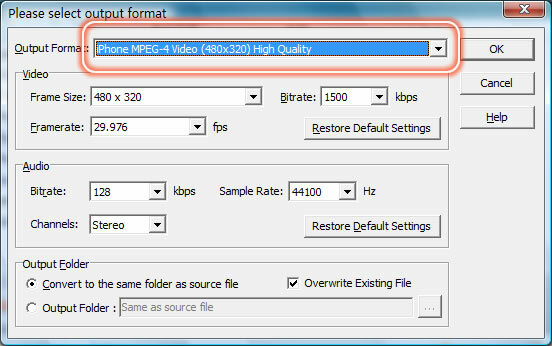 Raize iPhone Video Converter is an avi to iphone converter, which let you decode avi, divx, xvid, ms-mpeg4 format file. As an all-in-one video converter, Raize iPhone Video Converter converts WMV format to iphone mpeg-4 format. You can also extract audio from all popular video formats and convert them to MP3 audio file which Apple iPhone supports. Input: MPEG/MPG, MP4/MPEG-4), 3GP/3G2/3GPP, , AVI, DivX, XviD, DV, MOV, QT, FLV, MJPEG, M4V, WMV, ASF, DVD/VCD/SVCD, VOB etc. Output: iPhone, MP4/MPEG-4, MP4 AVC/(H.264, AVI, DivX, XviD, AAC, M4A, MP3.